The Austrian Economic Chamber, representing all 300.000 business in Austria, not only provides up-to date market information about Austria and its neighbouring countries, but also disseminates information about product offers and services of the EuroBali Export Network (e.g. newsletter) as well as market information about Indonesia on a regular basis to potential Austrian business partners. The Institute for Economic Promotion (WIFI) of the Austrian Federal Economic Chamber is the largest adult training institution in Austria. More than 300.000 entrepreneurs and employees attend appr. 20.000 training courses a year. Since 1990, WIFI Austria has exported its know-how in adult education world-wide, via a special task force, the International Know-how Transfer group and carried out trainings for Balinese SMEs in the framework of the EuroBaliExport Network. As a member of the Austrian Chamber Network, WIFI is closely co-operating with the Austrian Chamber’s Permanent Trade Commissioner in Jakarta, who has an excellent insight to the business situation of Indonesia. FORMAPER is a special Agency for adult training and consulting world-wide of the Milan Chamber of Commerce, Industry, Crafts and Agriculture. As partner in the EuroBali Export Network FORMAPER will provide up-to-date market information on Italy and will disseminate the EuroBali newsletter in the Chamber’s area of responsibility. The Kuta Small Business Association initiated the EuroBali Export Network and is locally managing the project activities. KSBA also supported the SME initiative to found the Bali Export Development Organization (BEDO) as a specialist export promotion body. 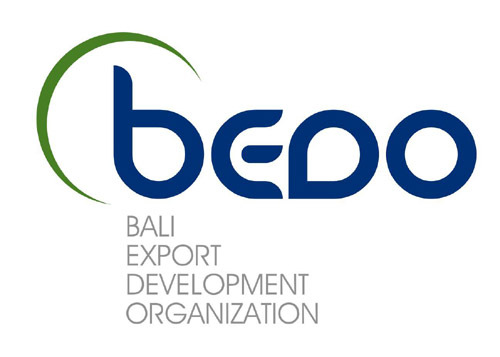 In the framework of the EuroBali project the Bali Export Development Organisation (BEDO) was founded as a non-profit organisation under Indonesian law, with the assistance of all partners. Founders and first leading members of BEDO are those balinese SMEs, who were the target group of the EuroBali training programme. BEDO promotes its members’ products towards the European and international market. To ensure a sustainable quality of services, product offers on this website for international buyers are exclusively from BEDO members. Since 1-12-2006 BEDO operates this website and the EuroBali Export Support Office in Kuta/ Bali on its own account.